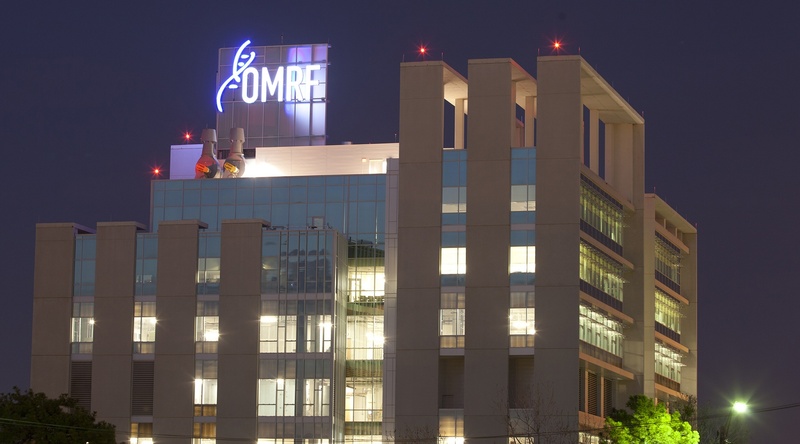 OMRF was founded as a non-profit organization in 1946 with the mission of conducting basic biomedical research to help people live longer, healthier lives. Our scientists are dedicated to understanding and curing human disease and focus on such critical research areas as lupus, multiple sclerosis, heart disease, cancer and Alzheimer’s disease. From OMRF’s inception, our scientists have focused on making laboratory breakthroughs that have a tangible impact on human health. Researchers at OMRF made discoveries that proved crucial to the creation of the protease inhibition cocktails that have added decades to the lives of patients suffering from HIV/AIDS. OMRF discoveries have given birth to a drug to treat children suffering from a life-threatening deficiency of protein C. Work in our labs also led to the creation of Soliris, the first and only treatment for a rare blood disorder known as PNH. A drug with OMRF roots became the first drug licensed under the European Union’s centralized procedure. And our researchers have created diagnostic and disease management tests for lupus and rheumatoid arthritis that are used in hospitals and clinics around the world. OMRF scientists also advance the understanding and treatment of human disease by publishing the results of their research in internationally respected publications like The New England Journal of Medicine, Nature, Science and Cell. Our researchers have published papers on topics that range from brain cancer to heart disease and diabetes to lupus. By pushing the boundaries of biomedical science, OMRF scientists are helping to win the war against human disease, one discovery at a time.